Ask fellow campers about "Island Campground and Marina" and nearby attractions. Camping on the river with Red Wing, MN across the river. Marina is on the river so when it floods everyone has to move out. Kind of tight with some low branches, but we fit 40 plus feet in. Good food at bar near entrance. We camped at Island Campground and Marina in a Motorhome. No casino here. That last (reviewing) person must have been at Treasure Island. Jamaicans cook food at the bar, a little overrated but good. Rv park connected with casino.. A little different configuration with blacktop and gravel. Only friendly person I have found do on this entire reservation was the gentleman that checked us in. Bring lots of cash, the slots are tight. We camped at Island Campground and Marina in a Motorhome. Go into Red Wing, neat riverside town. Stay away from from the buffet at the casino. This was our worst campground and camping experience. Very few shaded lots as per website photos. We were on a waterfront site, all rocks, poor site, unlevel, muddy and nasty with train across the river as well as a foundry with industrial noise and lights. There is a convenient restaurant/bar outside the gate, decent food at reasonable prices. However, unless you are truly part of the River Rat culture stay anywhere else! 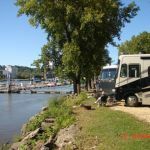 We camped at Island Campground and Marina in a Motorhome. This is a hard campground to review. It has a unique location on a peninsula (maybe island) in the Mississippi, across from Red Wing Minnesota. But most spots (all the desirable spots) are taken by seasonal rentals. We were in a spot right on the river, but very close to the highway bridge over the river and connecting Minnesota and Wisconsin--noisy all night. The Marina was directly on front of us, but it seemed in bad sharp with very few boats. Red Wing is an active port with a lot of train traffic and noise from the grain elevators, etc. so not peaceful--but a stunning sunrise with a beautiful down river view pretty much compensated for the noise and the "rustic" condition of the overnight campsites. We would recommend Island Campground to those in the area looking for a different kind of one night stay. We camped at Island Campground and Marina in a Travel Trailer. The campground owners were very nice and the park is directly located on the Mississippi river. There is good water and electric but only a dump station due to state riverfront regulations. Restrooms/showers are average at best. If you like to watch trains, boats and giant barges go by, this is the place for you. But all this action brings a lot of noise. The trains are especially loud and combine that with a very near highway bridge a quiet night sleep is hard to come by. The river town of Red Wing is minutes away. We camped at Island Campground and Marina in a Travel Trailer. We have been seasonal campers at this campground for the past two summers. It is great - plenty of shade, level sites, friendly owners and a lovely view. It is located on a beautiful island in the Mississippi River across from Red Wing, MN. 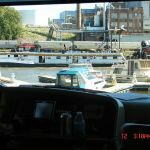 You can sit in your site and watch the boats and barges on the river, just feet away from you. The owners take excellent care of the campground, it is always clean, overhanging limbs are kept trimmed and the interior road is graded frequently. Because of the riverfront location, sewer is not available, but there are two dump stations and they do provide a "honey wagon" service. Sites are pull-in or back-in on grass or gravel. Wi-Fi is available at the office and pavilion and in the nearby campsites. Rate shown is the regular daily rate. (The seasonal rate works out to about $13 a day plus electric). We camped at Island Campground and Marina in a Motorhome. Nice older, but well maintained campground. I was in site #3 about 10 feet from the river. The site was extra large. It was relaxing watching all the boats come through the no-wake zone. The campground is in a flood zone, so it's mostly gravel and the electric boxes are on 6' posts. The Harbor Bar and Marina down the road hosts summer concerts, so the campground was very busy. The owners are very nice and accommodating. They only take cash or checks, so plan accordingly. I will definitely return again. We camped at Island Campground and Marina in a Travel Trailer. No casino here. That last (reviewing) person must have been at Treasure Island. Jamaicans cook food at the bar, a little overrated but good. Are you affiliated with Island Campground and Marina ?